Lewis Hamilton (1st, 1:34.794): "What a great way to end the season with a 1-2 qualifying session. I'm really proud of everyone at Mercedes, I couldn't have done this without the support and I'm really proud to be a part of the team. If you look at the team's performance on a race weekend this year - our mechanics, our engineers, our strategists - we've all raised our game and we continue to elevate ourselves as a team which is really inspiring to me; it encourages me to go out there and not let them down. The qualifying session today was great, it was a lot of fun. It went quite smoothly, the team did a really good job in getting the car into the right window. It's always difficult to improve on your last lap, particularly when your first lap in Q3 is pretty good, but I managed to increase the gap. It's still a long race tomorrow, there's a lot of work to do, but I'm really happy with today. I want to finish the season on a solid high, so that I can use that foundation to start strong next year." Valtteri Bottas (2nd, 1:34.956): "A great performance from the team - it's impressive to see that even though we've secured the constructors' title in Brazil, everyone is still performing on a really high level, everyone's still happy to be here and really motivated. I was hoping for pole today, but I think Lewis did another exceptional qualifying and I didn't quite find enough time in Q3. I knew that there was room for improvement left after my first run in Q3 and both Lewis and I found some time, but he just managed to get a more complete lap together. However, I'm happy that I got a decent lap in Q3 and that we were able to secure a well-earned front row lockout for the team. Our pace looked good, but it is extremely close with Ferrari and Red Bull, so we'll have to wait and see what happens in the race tomorrow. There are always opportunities in the race to get ahead, so I will be waiting for my chance and hopefully come in first." Andrew Shovlin: "We'd gone into the day hoping to be able to start on the UltraSoft tyre and hoping for the front row so naturally we're delighted with the way that qualifying went. We had quite a few changes to the cars overnight and looking at our pace in the practice session today, we seemed to have moved in the right direction. We were certainly happier on the hot track than we had been on Friday. We were surprised by the pace on the UltraSoft in the second part of qualfiying. We'd thought it would be really tight to go through but as it happened, Lewis had nearly 1.3 seconds in hand so the car is clearly working nicely on that tyre and hopefully that will carry into the first stint tomorrow. 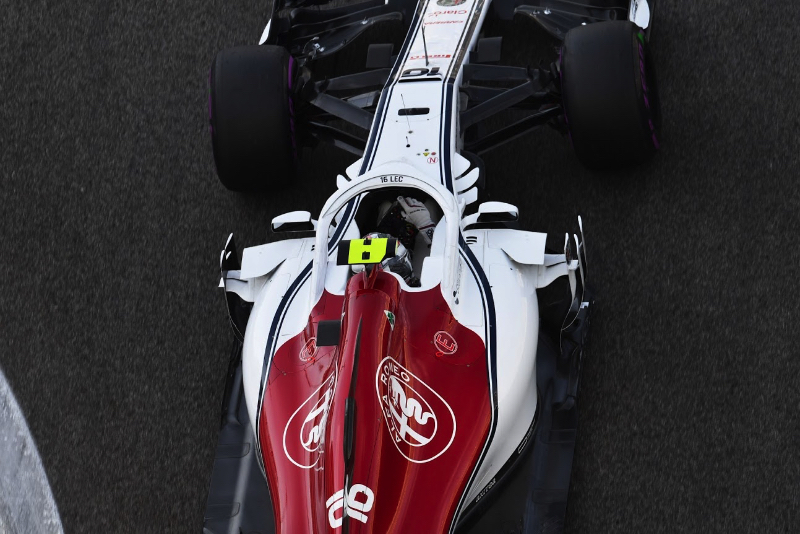 The HyperSoft is a bit trickier, even though the track is quite cool in the evening sessions it is still difficult to get the tyre to last the lap without overheating in the final sector. Both drivers did good laps in the final session and it was great to see Valtteri get back onto the front row on his final run and Lewis take another brilliant pole position. We know that we've still got a lot of work to do to win tomorrow and that Red Bull and Ferrari will be doing everything they can to take it from us, but we will keep pushing until the last lap of the season and hopefully finish the year in style. I also want to say congratulations to George Russell for his F2 title - well done, George!" Toto Wolff: "This weekend has been a special challenge: we are not here for championship points, the negative pressure is off and it's all about the enjoyment of racing. So to take the front row with Lewis and Valtteri is really special; this is a good Saturday for us. Both Lewis and Valtteri produced great laps at the end of Q3 to put some clean air between us and the Ferraris; and we have the positive of starting on the UltraSoft tyre for the first stint tomorrow as well. We know that we will need a good start, a strong first lap - and even after that, it will be a long race and very demanding on the tyres. We have managed to keep the energy levels high in the team and now we want to finish this fantastic season on another positive note. It's also been a really great day for George Russell - well done George, congratulations on a well-deserved F2 championship." Daniel Ricciardo (5th, 1:35.401): "Today was fast and fun, it was actually an enjoyable qualifying session. I thought I had Kimi for fourth but he just got me by half a tenth. I would be happier with fourth than fifth but we got through Q2 on the ultrasoft which was our target. There is a big step, maybe one second between the ultra and the hyper so we needed to do more or less the perfect lap on the ultra to make it through Q2. It was very close and I was in P10 but the team made the call to abort the lap and we just made it through. My first run in Q3 was good and we looked very close but both Mercedes and Ferrari improved. Fifth and sixth as a Team doesn't look that special on paper but the gap is small and we are competitive. We have solid race pace and hopefully our degradation will be better than Ferrari and Mercedes and we can apply the pressure. I'll be staring down the two Ferraris on the grid, they're in my way of a podium at the moment so I'll try and get in front of them as quickly as possible. All weekend our car has been strong, especially in the last sector, so the podium fight is on." Max Verstappen (6th, 1:35.589): "I'm not overly happy with how qualifying went today. After the first run in Q3 I knew we needed to get the tyre temperatures down in order to improve the grip. We tried this for my final run but unfortunately they were still too high, this meant I aborted my flying lap as I was just sliding everywhere, especially in the final sector. The car balance wasn't quite as good as it has been in previous qualifying sessions, I wasn't able to get what I wanted out of the lap. Starting on hypersofts wasn't the original plan but it could be interesting, being on a different compound to some of the others could prove helpful. Overtaking is a bit tricky around here, definitely not as straight forward as Brazil. It will take strategy and a bit of luck to be on top tomorrow. Our race pace once again looks good, so I'll do my best to get on the podium." Christian Horner, Sporting Director: "It was a strong session for Daniel to get through Q2 on the ultrasoft compound in his last qualifying for us. Max unfortunately didn't have a great run on his set of ultras, so resorted to the hypersoft in the final stages of Q2. That means we're starting from the third row on two different compounds which strategically could make things interesting. As we moved into Q3 unfortunately we couldn't compete with the high power modes of Ferrari and Mercedes, but Daniel produced a great lap to qualify fifth with Max just behind him in sixth. Our long run pace and tyre degradation has looked good all weekend, so we will definitely be in the fight tomorrow." Esteban Ocon (9th, 1:36.540): "I am pretty pleased with the overall result tonight. My Q1 lap was really good and I think we really extracted the best from the car across the session. We missed out on track time in final practice, but it was a great effort by the team to get the car ready for qualifying and make Q3. There will be a threat tomorrow from the cars outside the top ten, starting on better tyres, but hopefully we can make our strategy work starting on the hypersoft. It will be a tricky one but it will be interesting." Sergio Perez (14th, 1:37.541): "I'm disappointed with our speed today. It's been a poor weekend in terms of performance and there are still some issues with the car that we haven't managed to solve. It's hurting us over a single lap because the car is sliding too much and we're really losing out. Hopefully it will be a different story tomorrow with a free choice of tyres for the start of the race. I'm targeting points, but it's not going to be easy starting from P14." Otmar Szafnauer, Chief Operating Officer: "We haven't had a particularly smooth lead up to qualifying and I think that showed in our overall pace this evening. Esteban had power unit and hydraulic issues in final practice, but still managed to qualify in P9 with some tidy laps, which was an excellent effort. Sergio wasn't happy with the balance and struggled for speed in Q2, which means he will start from P14 with a free choice of tyre. It's not going to be an easy race tomorrow with all the midfield teams pretty equal in terms of pace, but I think good points are still achievable." Sergey Sirotkin (19th, 1:38.635): "It was very tough. The lap took a lot more from me than it probably seemed from the outside. The weekend so far has been the worst of the year for me the way it was going, with the struggles I had and the amount of work we had to put in. I didn't have any confidence going into qualifying, but I was really hard on myself and really motivated because I wanted to finish on a high. It took a lot from me physically and mentally to come back and perform at the top level. It hasn't been an ideal weekend, but I am happy and it is a little victory to recover like this. Thanks to the guys for supporting me all season long and especially to those who today were trying to understand what was going on and then make the best possible car for qualifying." Lance Stroll (20th, 1:38.682): "That was not very good. I am pretty frustrated with it to be honest. I thought there would have been much more, but we were just pretty slow, and the car was a lot different from how it has been all weekend, so I was a bit caught off guard by that. I think we had a decent balance all weekend and now that has changed. I don't know what happened, but I felt the car was very much on the understeer side. It has been kind of oversteer all weekend and now the balance shift is massive and I feel a bit frustrated, so that was the story of qualifying." Paddy Lowe, Chief Technical Officer: "Sergey had a pretty difficult practice and wasn't comfortable in the car, but by the time it got to qualifying he delivered all that the car was capable of delivering. Lance brought to a close a difficult season from a qualifying point of view. However, having two cars at the back of the grid provides plenty of motivation for us to work extremely hard over the winter in order to move ourselves forward for the 2019 season." Nico Hulkenberg (10th, 1:36.542): "I feel like I got everything out of the car and it was satisfying to get into Q3, but unfortunately the others just got a bit more pace in that last session. We should be more competitive in the race as we have the package to be able to fight and race hard. There will be four cars from the midfield teams fighting it out – I think it's going to be interesting tomorrow." Carlos Sainz (11th, 1:36.982): "Today was a difficult end to qualifying. The midfield was again extremely tight and finding a few tenths was a real challenge. After a strong first run in Q2, I struggled with oversteer and rear locking on the second run and just missed the top 10. I am confident we can target the points tomorrow. Start, strategy and pit stops will all be crucial, but we are ready for it." Alan Permane, Sporting Director: "We are well-placed and where we need to be. We were pleased to get Nico into Q3 but not particularly happy with the way the car behaved in that last session as we didn't seem to get the lap time improvement that we expected. Carlos just missed out on the top ten but if there is any silver lining, he has a free tyre choice. However we are well-placed with both cars and where we need to be to achieve our aims in the race tomorrow. We are taking a very low risk approach to the weekend as a whole as fourth place is all but secured. All the same we need to make sure we are in the running in case anything happens in the race. It looks like it will be a fairly straightforward race, but we will keep focussed until the very end." Brendon Hartley (16th, 1:37.994): "We knew it was going to be tight today, but I was P12 this morning so we thought at least Q2 was possible. To be 16th and just missing out on Q2 two weekends in a row is frustrating. The track conditions were really different compared to a few hours ago, so we probably couldn't get the most out of the car in Qualifying. We've put a lot of focus on race pace this weekend and there wasn't much between me and Pierre today, but I think we just weren't quite quick enough and I wasn't particularly happy with the balance of the car. Hopefully we've done some good work during the practice sessions so we can have a strong car for the race tomorrow." Pierre Gasly (17th, 1:38.166): "This was not the last Qualifying for Toro Rosso I would have wanted. Out of the last corner I came back on the throttle and lost power on the exit, I'm disappointed because the lap was coming together well. The car felt great and I was sixth-tenths faster, but then for the last two to three hundred metres there was no power. We had the pace to be around P12, so maybe not Q3, but to fight just out of the top 10. It's an important race for me tomorrow because the team has done so much for me since I've arrived, they gave me my first opportunity, so I'll do my best to have a strong performance and finish the season well. It would be a nice way to thank everyone and, even if we're not going to start in the position we were expecting, I will give it my all." Guillaume Dezoteux, Head of Vehicle Performance: "Brendon had a pretty smooth FP3 session, although it was a bit more complicated on the other side of the garage. Pierre had to back off his first run due to an electrical issue on the PU side, which was fixed very quickly, and then got hit by Grosjean in the exit of Turn 16, which forced him to abort his last timed lap. As for our Qualifying session, it didn't go to plan as we were definitely expecting something more today. Brendon struggled with car balance and unfortunately couldn't make it through. Pierre ran into another problem as he lost power out of the last corner while he was 0.6s up on his previous lap. That would have put him in a comfortable position for Q2 and we think we had the car today to fight for P10 - P11. We are not sure what happened at this stage and we need the car back to investigate in detail. For tomorrow, some interesting situations could arise from the cars that will start on the Hypersofts, so we will look into all of the options tonight to make our way through the field and target some points." Toyoharu Tanabe, Honda F1 Technical Director: "It is very disappointing that Pierre stopped on track with a PU issue in Q1, especially as this is our final qualifying session of the year. Brendon was also unable to get out of Q1 and so we will start tomorrow's race towards the back of the grid. Overnight, we will investigate the cause of the failure and prepare for tomorrow's race." Romain Grosjean (7th, 1:36.192): "It was a good qualifying. To be fair, my first run in Q3 was one of the best laps of my career. I crossed the line and knew there was not much more on track. It was good. I was happy. It was great to be in Q3 once again, adding to our tally for the year and especially at a track where we were not sure we'd be competitive. Tomorrow's going to be a long race. It's going to be interesting to see what we can do on the hypersofts, but I'm looking forward to it." Kevin Magnussen (13th, 1:37.309): "I didn't quite have the pace today, for some reason. I was just a little bit behind. The car was obviously good for Romain. He seems to be going well this weekend. Who knows, though, maybe it's an advantage tomorrow to not start in the top-10. Hopefully, it is. I would have liked to have been a bit further up, somewhere around 11th. If you can't get in front of the midfield in seventh or around there, it's possibly better to be 11th. I'm 13th and it's still not over from there, that's for sure. We'll see what we can do tomorrow." Guenther Steiner, Team Principal: "We had one in and one out for final qualifying. We were hoping to have both cars up into Q3 today. The cars were obviously fast. Kevin had an issue with his car. It was losing water pressure and it damaged the floor. Romain did a fantastic job on his lap. I don't think there was a lot more in it. Qualifying seventh for the last race of the year is good for the whole team. The car is fast, so I think Kevin can make some ground up tomorrow. Hopefully, we can get both cars in the points." Fernando Alonso (15th, 1:37.743): "We weren't optimistic at all about our chances of making it into Q2, as we haven't been too competitive in any of the sessions so far this weekend, so it was a nice surprise. I was pushing quite hard on that qualifying lap – it felt good. We start five positions away from the points tomorrow and hopefully we can benefit from some action in front of us. On pure pace we're maybe not in the top 10, but who knows tomorrow. Outside the car there's a lot of things happening this weekend: a lot of emotions and a lot of nice touches here and there. Tomorrow when I put the helmet on and jump in the car I'll treat it like the last one, and I'll try to enjoy it and do my best." Stoffel Vandoorne (18th, 1:38.577): "Today was a bit better than yesterday. It was my final qualifying of the year and it was all about having fun and enjoying it as much as I could. I know we've not been in shape all season really, so we did the best we could. Tomorrow, we're going to try and make the most of it, have a good start and a good opening lap, and then see what happens. It's never easy to go from FP3 into qualifying where the track temperature is so different. I think it's actually a nice feeling to go that way as you gain a lot of performance, but it's the same for everyone. I had a lot of fun out there today and tomorrow I'm going to enjoy it as much as I can too. I've had a good couple of races lately and I hope that continues and I can finish the season on a high – that's what matters. These cars are still nice to drive, even though sometimes when you look at the classification it's not always what you want to see. On the other hand, I'm looking forward to seeing the chequered flag tomorrow and starting a new chapter. I have mixed emotions about tomorrow. It's sad to leave so many people I've been working very closely with, but I'm also quite excited for the future." Gil de Ferran, Sporting Director: "Given our qualifying pace this year, coupled with the ever-changing track conditions from session to session here in Abu Dhabi, it was always going to be particularly difficult to predict where we would end up today. Stoffel had a clean run in Q1, and although he made progress on each of his three flying laps, it wasn't quite enough to make it into Q2. Thanks to a bit of magic from Fernando, who was able to put a flawless lap together on his final run, we progressed through to Q2. Unquestionably, whatever happens tomorrow, it will be an emotional day for all of us, as it marks the end of a challenging year for the team. We say farewell and thank you to Fernando and Stoffel, as well as commemorate the end of a chapter in the legendary career of our double world champion. We'll fight on together for the last time and will see what tomorrow brings at this spectacular venue." Charles Leclerc (8th, 1:36.237): "I am very happy about today. It was a good qualifying to end the season on a high and to thank the team the way they deserve to be thanked. It has been a great year and I aim to finish it with a strong result tomorrow. I look forward to the race." Marcus Ericsson (12th, 1:37.132): "It was a great last qualifying of the year. We went from a rather difficult beginning to the weekend to a successful qualifying outcome and did a good job as a team. Setting the car up in the way we did and making the necessary progress ahead of qualifying is very positive. The driving felt good, and I kept making improvements throughout the session. I put in some nice laps and am really happy with that. I am starting from a strong position with a free choice of tyres. We have a good chance to score more points and it will be a fun race to drive."